This is a delicious tart that could be served up any time of year. 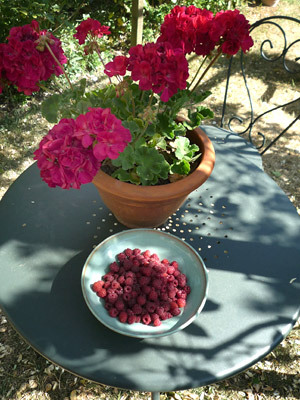 It’s an idea that came to me when I was trying to think how I could use a bowlful of fresh raspberries and a packet of feuillettée (puff) pastry from the fridge. Although I always make my own shortcrust pastry, having puff pastry to hand means I can always put something together quickly. My favourites are a simple fruit topping on a base of crême fraiche and an egg whisked together with a little sugar and maybe some spice if it’s apple. Alternatively, I make savoury parcels for dinner with a piece of salmon and some spinach, or simply vegetables in a creamy sauce. 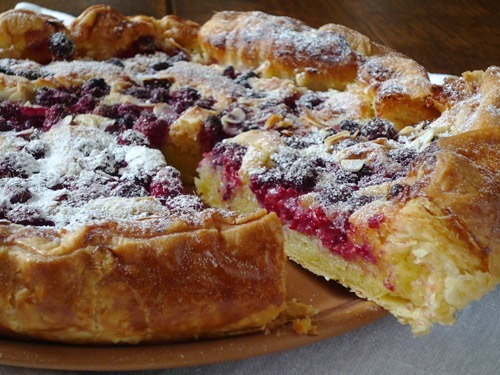 Today, I thought about making a kind of Bakewell Tart using fresh fruit instead of jam but putting the fruit on the top. The result is a gloriously light and colourful dessert which can be served warm or cold and it really doesn’t need anything else other than a glass of chilled white wine. Remove the pastry from the fridge and leave to one side to soften. Beat together the margarine and the sugar until light and fluffy then add the eggs a little at a time keeping back a small amount to brush onto the pastry. Gently fold in the ground almonds. Unroll the pastry onto a large shallow flan tin with a loose bottom. Spread the almond mixture over the base but not going right to the edge. Put the fruit on top, more or less covering the surface and sprinkle with flaked almonds. Taking the edge of the pastry between your fingers, lightly roll it inwards over the edge of the almond mix and brush the folds with the remaining egg. Bake for 30-35mins at 180C until the filling is golden brown. Sift icing sugar over the flan just before serving. I nearly always have one or two types of cake on the go, just for something sweet after lunch or with our mid-afternoon cuppa. Working from home it’s nice to have a small treat to loook forward to and it’s healthier and more satisfying than shop bought cakes and biscuits. Here’s a cake recipe which I originally found in a BBC food magazine, perhaps the vegetarian one but I can’t remember. The page was torn out and filed along with other favourites in an ever expanding collection. I love it, partly because it only makes one pan and a spoon dirty, and if you line the cake tin with greaseproof paper, you don’t even have to wash that either. But I mainly like it because it’s a lovely moist cake, you can vary the ingredients and keeps quite happily for a week in an airtight container. Line a bread tin with greaseproof paper and heat the oven to 180°C. In a saucepan, put the butter, sugar, dried fruit and milk and heat gently stirring regularly until the butter is melted. Don’t heat it up too much as you have to allow the mixture to cool before adding the dry ingredients. Test whether the cake is cooked by inserting a skewer into the cake – if it comes out clean then it’s done. Variations include adding 125g chopped apricots with 50g of roasted and chopped hazlenuts instead of the dried fruit. This is delicious and is a great way to use the cob nuts we harvest from the tree in the garden. I’ve also made it with sultanas and the grated rind and juice of a lemon – a much more summery flavour. I’ve found this can be too runny with the extra liquid so you could try reducing the milk slightly and adding a little more flour. 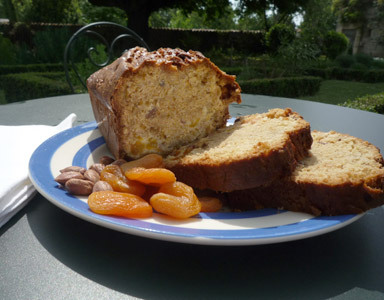 Author Julia MossPosted on Friday, May 6, 2011 Saturday, May 7, 2011 Categories Balandière, RecipesTags apricots, Cake, cob nuts, fruit, teatimeLeave a comment on Tea and cake always available!